Cold Cut Pizza that Lasts for Days! 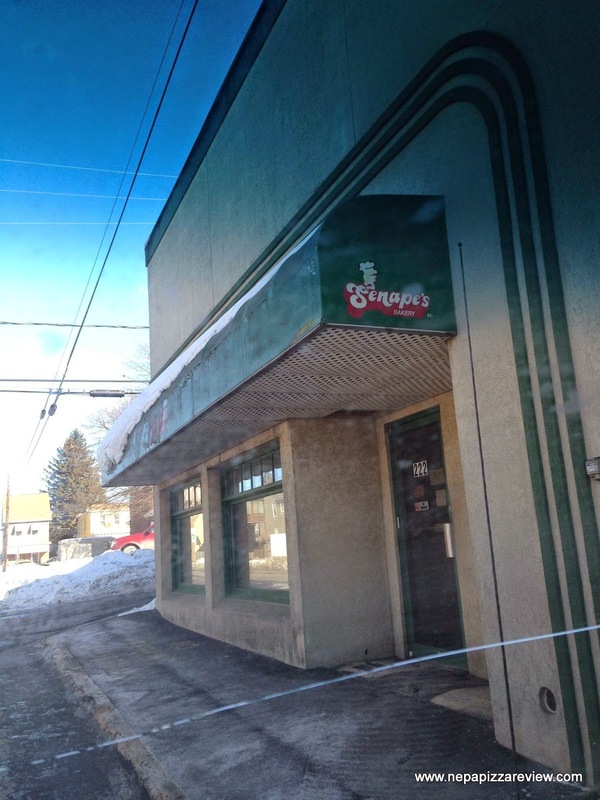 You may have seen Nardone Bros, Profera’s, and Longo’s cold pizza in the grocery stores of NEPA. 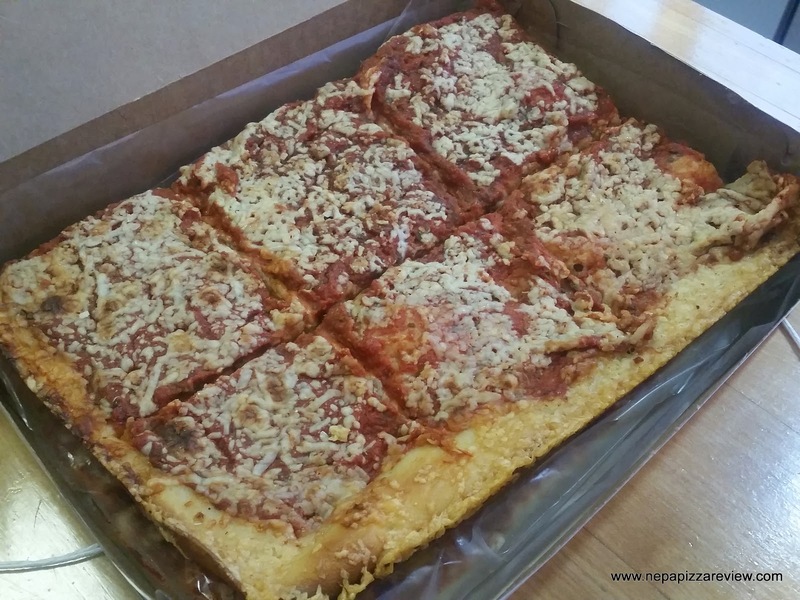 You may have already read my review of Carmen’s Bakery cold cut pizza. 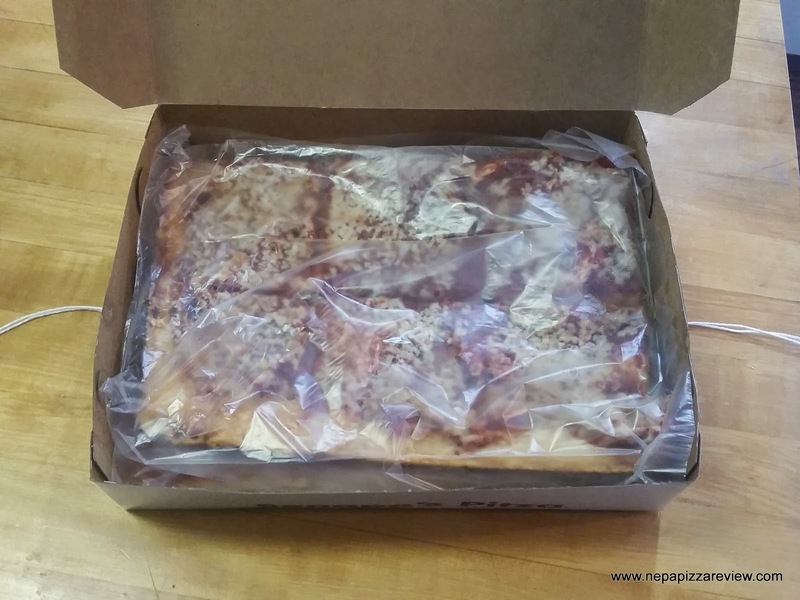 You may not even know what cold cut pizza is, but I was given a little anecdotal history lesson from a Hazleton native who told me that the original cold cut pizza is from Senape’s Bakery in his hometown. “Ska-mootz”, as I like to call this Hazleton native and ambassador, frequently gives me lessons on what the cuisine in Hazleton is all about since I don’t have the pleasure of visiting as often as I like. He is also known to generously bring me cold cut pizza from time to time for me to enjoy, and for you all to read about! Before trying the pizza, Ska-mootz challenged me to compare the Senape’s Pizza to the Carmen’s Pizza that I had recently reviewed since they were so similar and from the same town. This added an extra element to my normal review process. Knowing that the pizza was fresh that morning, I cut the string on the box and flipped it open, only to find a familiar looking pizza. It looked very similar to Carmen’s pizza: 12 cuts in a white box, 6 stacked on top of 6, separated by wax paper, and looking oh so tasty. After basking in the glory of another Hazleton artifact, I reached for my first slice. 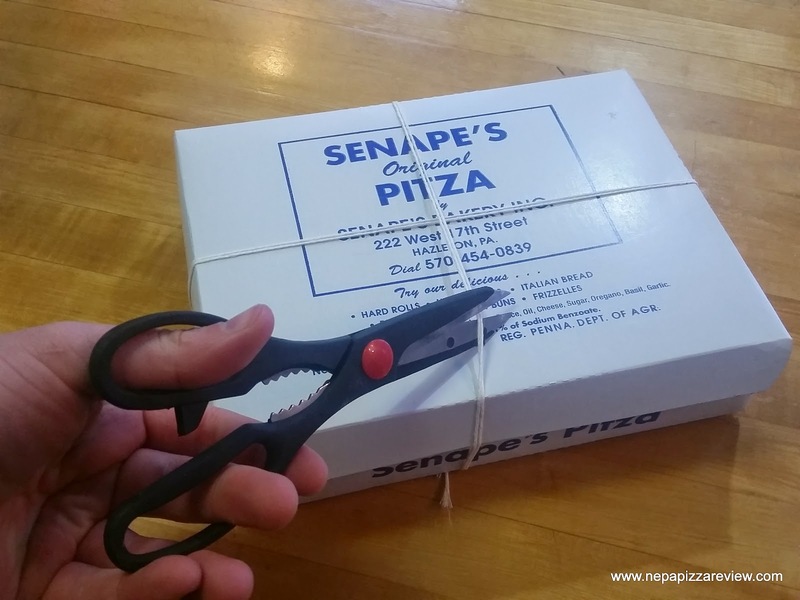 Upon initial examination, I noted that the Senape's pizza was cooked to a golden brown, and was actually quite crisp - not like the spongy cold cut pizzas that you would find in the supermarket. This was the primary difference between Carmen's, which was more lightly cooked and spongy, and Senape's. I took my first bite and really enjoyed the flavors, texture, and crispness of the pizza. The crust was more similar to a traditional old forge crust that you would get fresh out of the oven. The sauce was similar to a hearty pasta sauce with a ton of flavor and great texture, which I also enjoyed. The cheese was also tasty, a dry cheese which was shredded relatively finely and applied somewhat sparingly where you could still see some sauce between the strands. It would be easy for me to declare a tie between Carmen's and Senape's, but that would be no fun, and I would be letting Ska-mootz down so I will say that on day 1 of the taste test, I preferred Senape's pizza by a razor thin margin only because I thought the crispier crust had a more satisfying texture to me. I stored the pizza at room temperature and continued my taste test for 3 more days, for a total of four. On day 2, I noticed that the crust was no longer as crisp or tender as it was on day 1, and the sauce had started to break down slighty, but the pizza was still very good and I wondered if I was going to be able to stay away from eating the whole pizza and save a few slices for days 3 and 4. On days 3 and 4, the crust and sauce continued to break down a bit more as would be expected, but there was never a substantial decline in quality and was always a nice addition to my day! I will say that I thought that the Senape's pizza did break down at a faster rate than Carmen's, so I preferred the spongier Carmen's pizza on days 2-4 as the shelf life was a bit longer. My contrasting points may seem to point out more major differences between the two pizzas, but the fact is that they are very similar and they are super versatile pizzas great for a quick snack or to travel with. I can't provide you a difinitive winner because I did prefer Senapes in the short term, but Carmen's over the long haul. 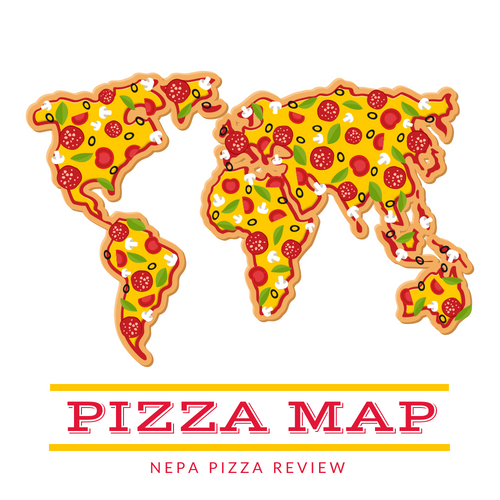 I would be interested in hearing your thoughts in this great pizza debate, especially if you are from Hazleton and have a history with these fine establishments!